Waste is a mismanaged and under-utilised resource the world over. gaspros portable biodigesters are scalable, easy & simple to assemble. These biodigesters involve no civil work and can be manifolded to suit the local situation. The biogas produced is 65% methane rich and can be used for power generation & cooking. Organic manure is also generated as a by-product, ensuring enhanced value for money. gaspros portable biodigesters are available in manual and automatic variants. The product is available in off-the-shelf capacities of 3, 5 & 10 CBM, which can be manifolded for easy scale-up. This solution suits the requirements of homes, apartments, restaurants, farms and more. Biogas is released when organic matter turns to compost. This is raw biogas. Raw biogas has a mixture of inert & corrosive gasses along with methane. However, this cannot be used directly and a multi-step process is typically involved to render the biogas application-ready. Our biodigesters eliminate the need for these processes and consistently produce 65% methane-rich biogas. gaspros stationary biodigesters treat both kitchen waste and sewage water to produce consistently 65% methane-rich biogas, which can be used for power generation and cooking. This solution also reclaims high-quality water from sewage, which conforms to recommended national standards, and can be reused for gardening and toilet flushing .This solution can be customised to suit the locations and requirements of schools, hotels, hospitals, gated communities, small & large housing projects & more. Typically, waste from the kitchen and bathroom enter a two-stage biogas septic tank system where biogas is produced and then desulfurised. Wastewater then enters an equalisation tank where the flow rate is controlled. 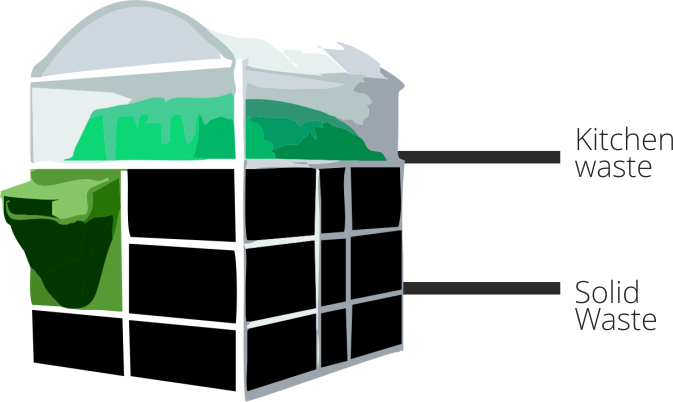 A three-stage aerobic tank system then treats the wastewater and reclaims it for use in gardening and toilet flushing.